Editors note: This post is part of a series that explores the top ten reasons why customers trust Google with their business data. A complete top ten list can be found here. People expect their email and productivity tools to just work, and we’re very proud of the reliable services we’ve been able to give our customers. 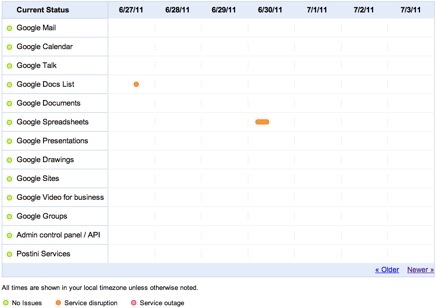 Last year, Gmail was up and running 99.984% of the time, and in the first half of 2011 we’ve delivered 99.99% availability—that’s less than 5 minutes of downtime, on average, per month. But we aren’t perfect, so providing you with information on how our apps are performing is very important to us, and we’re committed to being transparent with you in the event that something goes wrong. To this end, we’ve developed a new Apps Status Dashboard that we believe will give you accurate information faster. The former day-by-day design will be replaced by the new dashboard which gives a more clutter-free status with a single, continuous timeline. The new dashboard shows only service disruptions and outages. The size of the dot will indicate the length of outage and the color will indicate the severity. The dot to the left of the service name will show the current status of the service. When you click on one of the yellow or red dots in the timeline, you’ll see a single transcript that will display all the status messages until final resolution—even if the outage spanned more than a single day. There will now be a single URL that describes the issue and resolution for the entire outage. As before, the dashboard is visible to everyone on the web—there’s no username or password required. 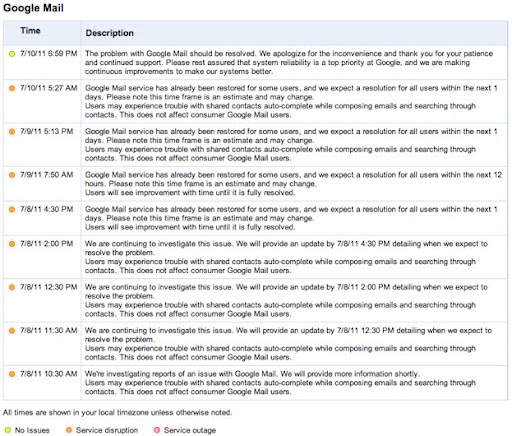 We hope you’ll find this new presentation of Google Apps status to be even more accessible and useful, and please share your feedback in the comments below. Just a little comment about the new look. Some of us (8% of male population;) have problems with the color coding (mainly red green). Perhaps you can consider introduce a little difference in the bullets. Size, shape, or a drawing inside, any. Please don't relay only in colors to show the status. There's a lot of users (about 8% of us) with any type of color blindness issues. A little shape coding will be enough and very very welcomed. When I try to create a new document, all I get is "connection terminated by server"